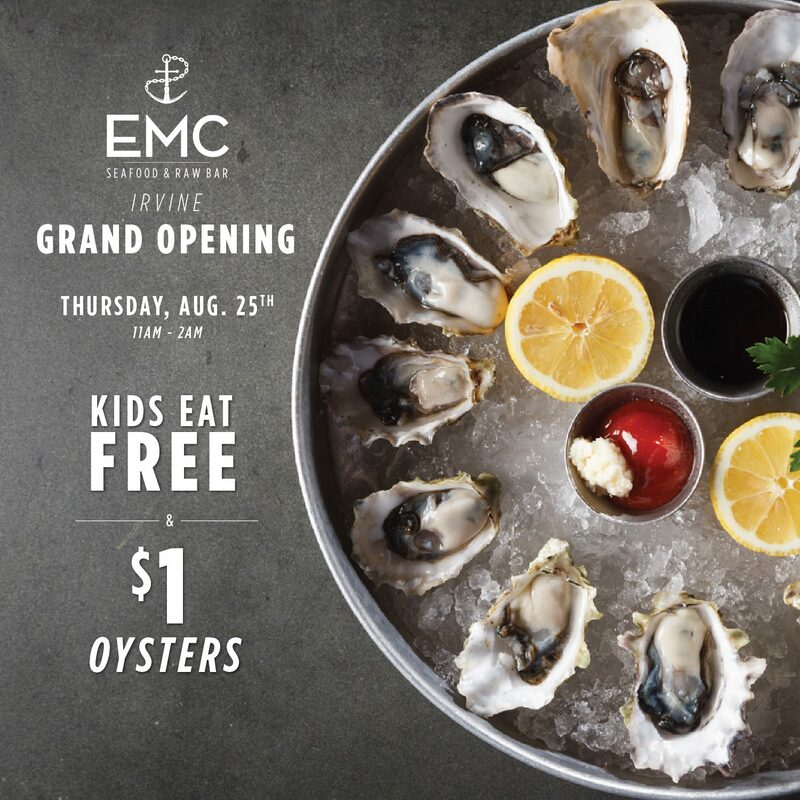 EMC SEAFOOD AND RAW BAR: GRAND OPENING IN IRVINE OFFERS $1 OYSTERS ON AUG 25 - EAT WITH HOP! Aug. 25 is Irvine's Official Grand Opening Celebration Day for EMC! Get the grand opening deal from 11am - 2am! Enjoy $1 Oysters (Chef's Choice). Details: Grand Opening Celebration Day $1 Oysters and Kids Eat Free Offer are valid for dine-in only on August 25, 2016 at Irvine location. $1 Oysters are chef's choice, no substitutions. Children 12 years and under eat free from Kids Menu with adult food minimum sub-total purchase of $15. Kids entrée does not count towards purchase minimum. Limit (1) offer per guest. Cannot be combined with any specials or discounts. EMC Irvine reserves the right to end this offer at any time without further notice. Other restrictions may apply. See restaurant for details. Call to make your reservation 949.748.3979! I've never been to Irvine location of EMC before but I thought they were .... already open? Is this like official official?! I have been to their Korea Town location and it was awesome! This place is expensive. Yes, it is pricey and I got a small bowl of uni pasta for about $20. Although it was quite small, I shared it with a friend which made me even less satisfied because it's so little to share! But I do gotta say, it's very creamy uni pasta which I love. And I think it's worth it once in a while!